Bluetooth speakers are a pretty great concept but you have to pay a lot for the best sound experience, right? Well, not exactly. Anker has swooped in with its Soundcore Flare demonstrating that a mid-range speaker can meet your needs without hurting your wallet. Styled in a fashion highly reminiscent of the newer fabric-clad Amazon Echo speakers, it’s a pretty neat looking speaker. With the promise of good sound quality, a rugged waterproof design, and even a beat-driven light show, it packs in a lot for a mere $60. Does it deliver on that promise for such a great price though? Here’s a breakdown of our experience with the Flare. 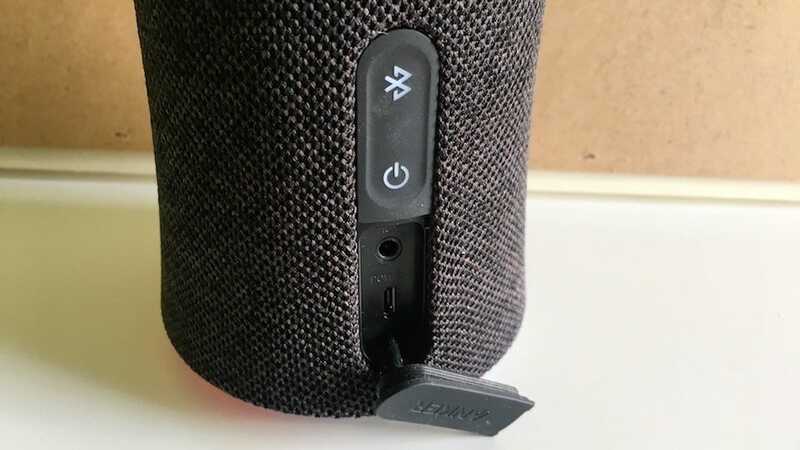 Bluetooth speaker setup is either a strong hit or a strong miss—either pairing is a snap or you spend twenty minutes mashing the pairing button and fiddling with your phone. Thankfully setup with the Flare was as easy as you’d expect from an established company like Anker. My review unit came with a partial charge so I simply took it out of the box, hit the Bluetooth button, dived into the Bluetooth section of my iPhone, and music was able to start playing. I did this while my mother watched and appreciated that she’d have no problems doing so either—a huge plus for any setup process. It was the perfect introduction for Bluetooth speakers for her. The only “downside” during the setup process was the default volume was pretty high and the start of Foo Fighters’ Monkey Wrench came on, and subsequently freaked out my cat. Of course, I was too busy revelling in the sound quality to be too bothered. 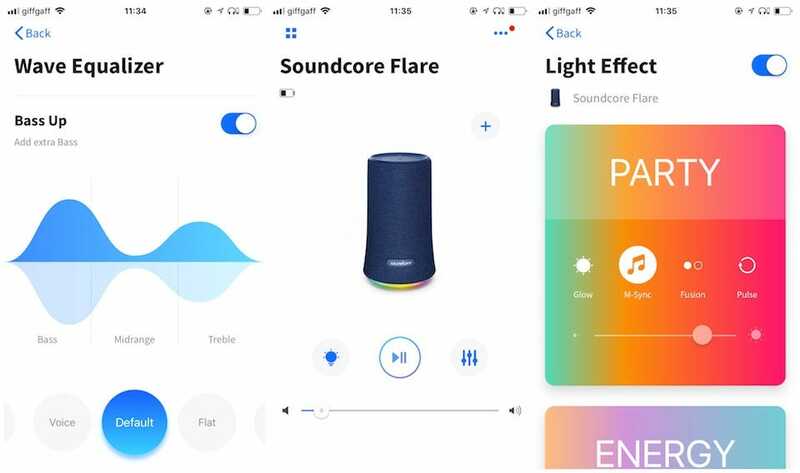 If you want additional control over the speaker—and if you’re buying this speaker that’s what you’re interested in, naturally—you need to download the Soundcore Flare app (iOS/Android). What do you get with the app interface? 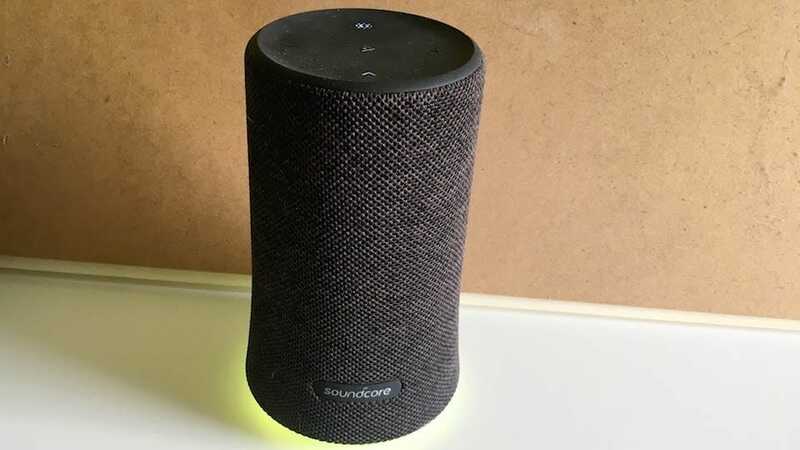 You can tweak the equalizer settings, set up a light show (the base of the speaker is a full RGB light array), update the speaker’s firmware, and even pair it with another Flare for stereo/multi-room playback. More on all that in a moment. Impressions: How Did I Live Without It? I’ve used various smaller Bluetooth speakers around my home before, but they’ve never really stuck with me. It’s often because they hardly look the part. It’s a shallow thing but we all want our homes to look good, right? That’s where the cylindrical manner of the Soundcore Flare really does the job well. It looks pretty cool and just the thing to park on your desk or the coffee table in your living room. In the past, I’ve used the Creative Halo for a similar light and sound show, but it always looked a little bit too juvenile for my liking. It was garish and the kind of thing that would be great for kids but not in sync with my urge for a more subtle, chilled ambiance. The Soundcore Flare does light better than that with the halo of LEDs at the bottom of the device so it’s noticeable but not too noticeable. Although, if you want to make the halo flash like crazy, there is an option for that within the app which is useful if you’ve got a big party going on. The most important thing, of course, is sound quality and that’s something I was quite impressed by. It has dual drivers arranged back-to-back for maximum optimization and it comes across well. The bass is suitably powerful with mids and trebles sounding about right. With a penchant for the Foo Fighters’ back catalogue, I enjoyed hearing Dave Grohl’s voice boom through the speaker at just the right volume. No matter how loud I cranked it up, it never sounded distorted. On the other end of the spectrum, I tried out a friend’s album as it’s a much quieter affair. Having listened to it on my car stereo, it’s easy to miss certain nuances given the lower production values. In the past, only some expensive earphones managed to highlight the little extras, however the Soundcore Flare picked them up nicely too. If you want a little more ‘oomph’ to your music, there’s the addition of a BassUp button on the speaker itself, enhancing the bass frequencies in real time. 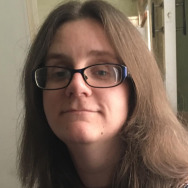 I didn’t find I needed it, mostly because it never felt like it added a sufficient amount of depth to remember to switch it on. It’s a subtle improvement, for sure, but it’s useful to know it’s there if you’re that desperate to feel like you’re getting the most out of your listening experience. Really though? You’ll probably forget all about it. Elsewhere, the Soundcore app allows you to customize the EQ for whatever you’re listening to, tweaking things via a specialized sound profile. I mostly left it to figure things out by itself, but if you’re that way inclined, it’s a simple way to feel more in control of how things sound. Compared to your average Bluetooth speaker, the Flare is packed with extra features. You can hook up two Flare speakers via one single device for stereo sound or double the volume but with only one speaker on hand that was the only Flare feature I couldn’t field test. I can see it being great for a large party or simply for when you want to take in music a little more prominently than usual. One speaker alone is powerful enough that I can imagine two sound even more potent. There’s Amazon Echo support too, enhancing Alexa’s voice throughout your home. 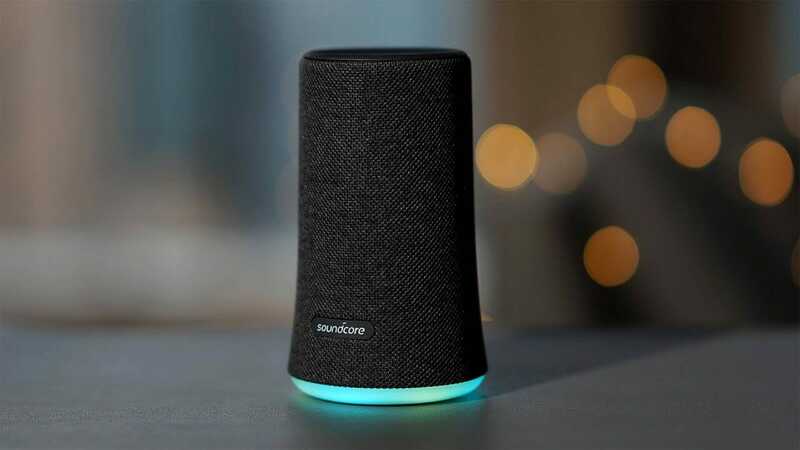 This all sounds pretty great for a home speaker but, impressively, the Soundcore Flare isn’t just for when you’re at home. It’s reasonably tough and offers about 15 hours of battery life, so it’s good for taking out and about. It also offers IPX7 waterproof protection. That means it’s fully waterproof in the face of submersion up to 1 meter which makes it great for the shower and poolside alike. Bear in mind though—you need to make sure the microUSB charging port and Aux-In socket are completely covered by the plastic exterior before you do this. It’s not hard to keep covered, but it is something to consider. The only slight failing with it is that it does love to attract dust. All dark colored devices, naturally, show more dust than light colored ones but the textured rubber on the top of the Flare, in particular, was an incredible dust magnet. In a very short space of time, I found it pretty dusty in no time at all, as you can see in the photos. It’s never as clean as it is the moment you take it out of the box. I’ll be blunt—I really like the simplicity of the Soundcore Flare. The part where it just works, no matter where I take it, and it works well is a huge boon for me. I love tinkering with tech but it’s also great to just use something without poking around too much. However, for those times when I do want to get more hands-on, I really like being able to dip into the app and tweak the sound or light show. Essentially, it’s the best of both worlds: simple when you just want tunes, fun to play with when you want to mess around with customizations. From the strong sound to the fun LED effects, the Flare is my new favorite portable Bluetooth speaker.